When you have a motor home, whether it is your first one or not, you are probably going to want to load it up with all of the latest and greatest accessories available. You can do a lot of your shopping with little effort through the many motor home accessory websites that are available online. You will be a happy camper when you see the amount of items you can get to spruce up your motor home away from home. There are a lot of great things that you can get for the interior of your motor home to make you feel as comfortable as possible. If your RV is not already equipped with one, you may want to look into purchasing a Rear Observation System. These are an amazing help when you are backing up into your campsite or trying to your motor home fit into a tight spot in a parking lot. A Navigation System can give you a hand keeping track of where you are in your motor home and where you need to go, best of all, you will never get lost in your motor home again. There are also some great stackable washer/dryer combos as well as an all in one washer/dryer combination. Either can save you lots of time as well as precious space in your motor home. Sometimes you may have an overhead bed or bunk bed in your motor home but you do not have a ladder for easy access. There are some great lightweight ladders available online that are durable enough to hold up to six hundred pounds. Plus, the steps are padded for extra security to help against slipping. If you are in the market to buy some great outdoor accessories for your motor home, such as everything that you may need to put on a decent barbecue, you can find it all online as well. An absolute must for the true camper is a Portable Fireplace. It is a portable grill and fireplace combo that you can use wherever you decide to stop your motor home to camp for the night. If your campground is located on or near a beach, then this portable fireplace is an awesome way to take the chill of the cool breeze coming off the water. Looking to set up a campfire in a pit at your motor home camp site? Then you may be in the need for some great outdoor travel chairs or lounge chairs so you can sit outside of your RV and roast marshmallows in comfort. You can find many great mesh chairs that are lightweight and durable as well as fold up nicely for storage and travel. There are even great folding tables available so you could even sit next to the fire playing card games for two! While you are at it, if you do not already have one, you may want to get a chair rack to hang from your ladder on the back of your RV. You can get them to fit just about any ladder from any model RV, and they can usually hold up to 6 chairs. As far as decorations go to enhance your camping experience, there are lots of different items that will help you spruce up your outdoor area around your RV. You can buy wonderful, durable weather-resistant rugs that come in many different colors and sizes. They are made of outdoor turf designed just right for easy cleanup, just perfect for your outdoor meals. If you have been camping in a RV, you have probably seen some of the really interesting lights that people hang from their awnings to decorate their camp site during the evening hours. These lights are made specifically for either indoor or outdoor use and come in a ton of different designs. Just some of the cool lights you can choose from are cowboy boots, colorful Caribbean fish, festive fiesta peppers, patriotic American flags, beautiful flowers, moons and more. The possibilities for accessorizing your RV are endless! 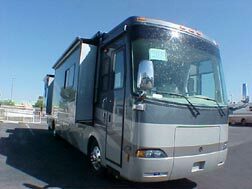 >> Shop Class A Motor Home Online!